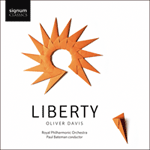 Liberty is written for violin, viola, piano and strings and is in two distinct parts. In the opening section I wanted a graceful feel that allowed the soloists to each have their own space to perform. It is followed by the fast, almost rustic feel of the second section where I often score the violin and viola in octave unison which allows their theme to be heard even when the full string section are playing at forte.